Driving under the influence means that a driver is found to have "some" impairment of coordination rather than the "substantial" impairment required for a conviction for driving while intoxicated. Nevertheless, penalties for conviction on the lesser offense can include two months in jail and a $500 fine on a first offense and as long as a year in jail on a second conviction. The offender also may be placed on probation for three years. If a driver does not receive probation before judgment, eight points are assessed on his or her license, and that license may be suspended for a lengthy period and subject to work or alcohol-education and -treatment restrictions. Alternatively, a driver may be required to install an interlock on his or her car, which requires a breath test before and during driving. Some cases are referred to the Motor Vehicle Administration's Medical Advisory Board, which may monitor a driver for years to ensure that he or she remains alcohol-free. This is getting off easy? The Post bought the claim by the State's Attorney's Office that pleading to the lesser charge of driving under the influence is a bargain for drunk drivers. Indeed, it is a bargain--but not for the defendant. The benefit all goes to the state, which often is relieved of the burden of proving a weak case. Many cases that are tried result in either acquittals or convictions for driving under the influence. Rarely will a defendant who goes to trial and loses on the more severe charge of driving while intoxicated do worse than pleading guilty to the lesser charge of driving under the influence. Further, unlike many states that share Maryland's standard of a .10 blood alcohol reading for driving while intoxicated or have a lower .08 standard, Maryland routinely prosecutes drivers with a reading of .07 or lower. Further, in Maryland, .07 to just under .10 has been considered evidence of impairment. 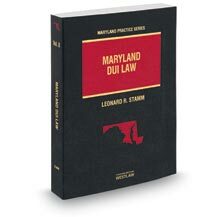 The reason Maryland has rejected the .08 standard for intoxication is that no scientific evidence shows that every person is intoxicated at .08. State's Attorney Doug Gansler was quoted in the series as saying that he opposes probation before judgment in every case. That allows him an easy criticism of judges who give probations before judgment, but it also is hypocritical: In probably 95 percent of first-offense cases, Gansler's prosecutors do not object to probation before judgment. One article discussed with apparent admiration a New Mexico court that has produced a low recidivism rate for drunk drivers. But it didn't mention that Montgomery County has similarly successful programs for chronic offenders, including its Pre-Release Center, the Calvert County DWI Treatment Facility and Right Turn of Maryland in Owings Mills. When I have my clients enter one of these facilities, they get treatment at a reasonable cost. Because the recidivism rates of these programs are lower than that of jail, the public also is better served by drunk drivers' getting treatment than by having them spend time in jail. Judges are right to reward defendants who make a sincere effort to change their behavior before they get to court. For this reason, The Post was unfair to criticize the judges who preside over drunk driving cases. These judges struggle to balance the needs of the public with the rights of defendants. The articles suggested that these judges are giving light sentences compared with other jurisdictions but gave no figures on similar cases in the District or in Prince George's, Anne Arundel or Howard counties. Based on my experience, such figures would not support that contention or The Post's conclusion [editorial, Sept. 26] that the Montgomery County system should be "blown up." The current system for dealing with drunk drivers in Montgomery County is balanced. Unfortunately, The Post's articles may pressure legislators to enact laws criminalizing the refusal to take a breath test, declaring that every person with a .08 breath test is intoxicated and requiring judges to impose Draconian mandatory minimum sentences. Such laws show little regard for the rights of ordinary citizens, diminish our civil liberties and tip the tables in favor of the government against the citizen accused--who just might be innocent. is on the board of the Maryland Criminal Defense Attorneys' Association.